We help people get out of Credit Card Debt! See How Much Money We Can Save You! By providing your information, you consent and request to be contacted by CreditGuard and/or our member(s) to your phone, cell phone, email, text/SMS, and through the use of pre-recorded messages and automated dialing technology at the number(s) listed above even if your number provided on the form above is on a State, National or Corporate Do Not Call List. You are not required to purchase any goods and/or services. Standard carrier and messaging rates will apply. Home » Blog » How Much Should I Spend on an Engagement & Wedding Ring? How Much Should I Spend on an Engagement & Wedding Ring? If you’re wondering how much you should spend on an engagement and wedding ring, there one thing you need to know right now. DeBeers made this rule up to sell diamonds. This “rule” has no more validity than any other arbitrary recommendation. Your decision to spend money on jewelry should be based on budget and your values. As you make the decision to get married, your most important task is getting on the same page financially with your partner. More important than the amount you choose to spend on a ring, you should choose to start your relationship on stable financial ground. There’s nothing heroic about spending too much money on something you can’t afford, just to save face or comply with a social norm. Budgeting and paying off debt is much more important to the quality of life that you’ll have with your spouse than the size of a rock. That being said, there’s nothing wrong with investing in a high-quality ring! Weddings are an important ritual, and honoring that experience is valuable. But, after the wedding is over, you’ll have memories, and you’ll have bills. 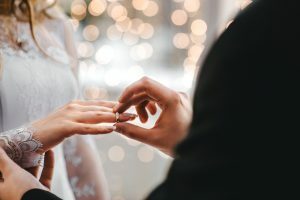 Before you decide how much to spend on an engagement ring, it’s important that you understand your current financial situation and your partner’s situation. Moving forward, your debt will be theirs, and vice versa. If you’re currently in a situation where you’re behind on your bills, the idea of saving up for the big ring could be stressful if not impossible. When it comes to your finances, nothing is more important than a stable foundation. Call CreditGUARD if you’re in a situation that you can’t manage with your credit debt. Our certified credit counselors can help you decide which path to take when it comes to your financial future.